It is not comfortable to use the Sound API in .NET, because there is no support by the class library itself. So I decided to write my own small Audio Assembly WinSound.dll by using PInvoke and the native WMM API (Windows Multi Media). With help of this library you can play or capture audio sound in an easy way. 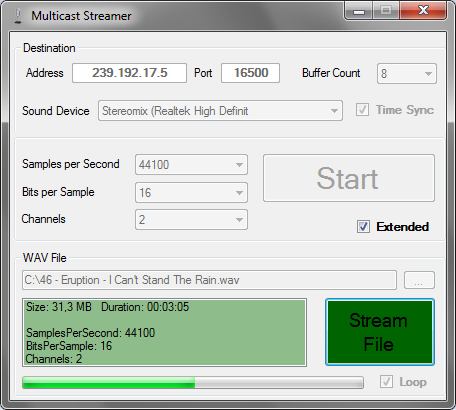 In addition i wrote some Network Assemblies, to stream and play Audio Data over Network by Multicast. The WaveOut and WaveIn functions of WMM are very tricky, because you have to know some special features of how to work with the internal buffers and handles. For example you can not stop a recording, without waiting for all buffers to finish. You are not allowed to stay too long in the Callback functions. You have to swap from managed to unmanaged code. The Repeater is the most sensitive one, because you have to balance the recording and playing buffers all the time.